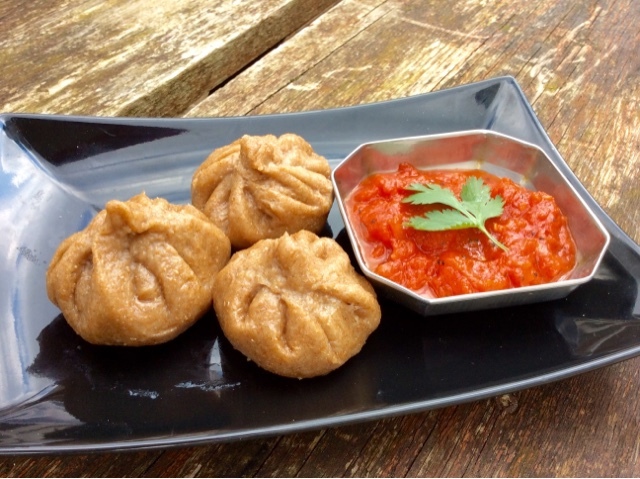 Momos are fun to cook and fun to eat! 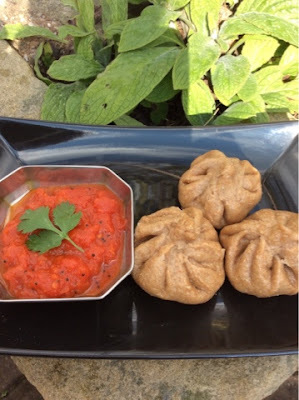 I first tried these steamed stuffed dumplings in a Tibetan restaurant by the lake in Pushkhar, India, where they were packed with veggies and served floating in broth. Filling and wholesome. We don't really cook with white flour, though, so when I created our version of momos I used organic wholemeal flour with the bran sifted out. 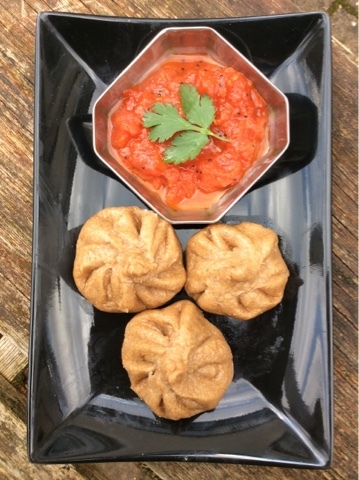 I decided to go for the Nepali/ Indian version served with chutney, but with a Tibetan filling of tofu, ginger and coriander. 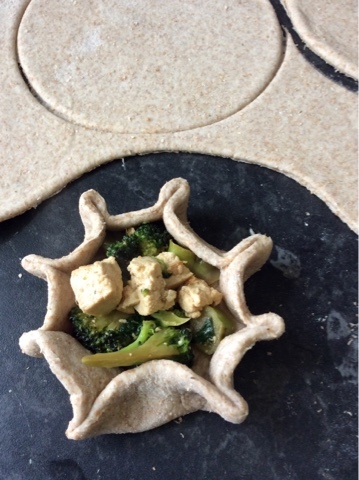 I couldn't resist adding broccoli as the tiny florets hold in flavour and moisture so well. 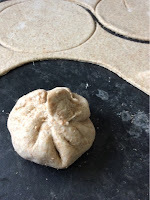 They may seem fiddly to make, but once the dough is kneaded, the steamer set up and the filling made, shaping these little parcels of goodness is actually rather enjoyable. You can have your chutney bubbling away as they steam, too. "Shall I make them again?" I asked the family while tentatively studying their faces as they ate (they are used to this by now as we are always trying out new things on them). The answer was a unanimous "Yes!" warm water to mix- about 225-250ml. Make the dough first, by adding the oil then the water. Knead it for a minute or two. It should be moist but not sticky, and easy to handle. Let it rest in a plastic bag while you get tthe filling together. Dice the tofu small, mince the chilli, grate the ginger and cut the broccoli into really small florets, dicing any stems. the smaller you chop the ingredients, the more evenly they will be distributed throughout your filling. In a wok or karhai heat the oil and add the broccoli and salt. Put the lid on, turn the heat down and steam-fry until nearly completely tender. Remove the lid, turn up the heat a little and stir in the tofu. After a couple of minutes Add the coriander, ginger, hing, tamari sauce and chilli. Stir well and cook until tender. Set aside to cool. Keep going until you have all the momos ready, or, if your steamer only takes about four like mine does, make four, put them in the steamer and then make another four. Each batch will take about 15 minutes to steam, on a medium heat. You can make whatever dipping chutney you like. Something like the red sauce you get with samosas from the takeaway would be great. I kept mine simple and not hot because of the chilli in the momos. You can find the recipe here. Thanks for posting this! Especially the dough part - I need to try it! I so want these right now!! !